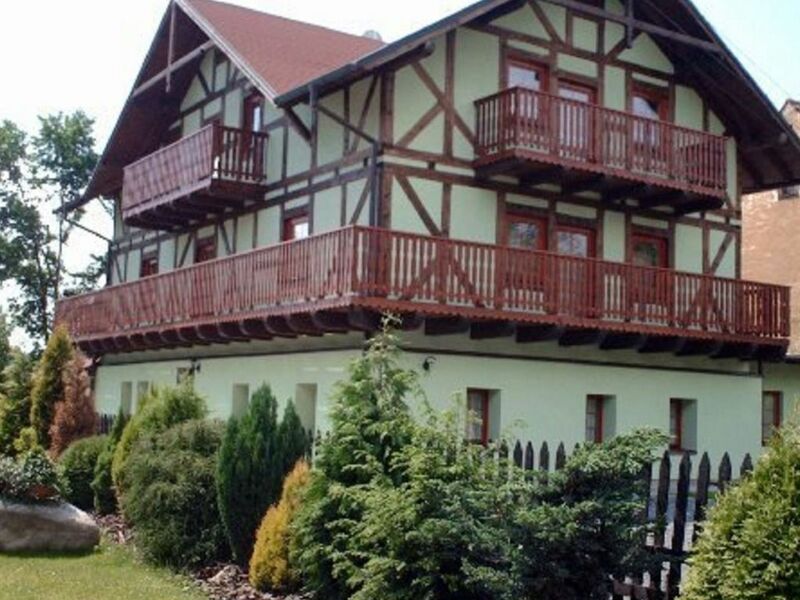 This nice accommodation, consisting of 2 houses (see also: CZ-36233-02), is situated just outside the village of Hroznětín, at the foot of the Ore Mountains. The village is at an altitude of around 600m and makes an ideal base for exploring the region, both in summer and in winter! There are plenty of options for great walks and mountain biking and there are a few golf courses nearby. A visit to the beautiful spa resorts in this area is also a must. The most famous one is Karlovy Vary (10 km), with its many springs and attractive town centre. In this town, you could also visit the Becherovka museum. The spa resorts of Frantiskovy Lazne and Marianske Lazne are worth a visit, too. During the winter months, you can get your skis on! In Pstruzi (5 km from Hroznetin), you can take the chairlift to Plecivec (1,210m) where you can choose between various slopes, including down to Albertamy. The large skiing area of Bozi Dar and Klinovec (850-1,244m), with lifts and 70 km of cross-country skiing trails, is around 10 km away. And the Oberwiesenthal, the largest skiing area of Saksen (Germany), is also easy to get to from your holiday home. Wir haben ein ordentliches und sauberes Ferienhaus vorgefunden . Mit großem Wohn-Esszimmer und komplett eingerichteter Küche . Platz für 2 komplette Familien und genügend Bewegungsfreiheit für Kinder. Das Haus können wir ohne weiteres weiterempfehlen . Gern wieder . Möbel sind teilweise sehr alt. Vermieterin sehr nett. Haus ist schön. Das Haus ist gut ausgestattet, Parkplätze sind ausreichend vorhanden. Hroznetin ist ein kleiner Ort, es gibt kleine Tante Emma-Läden und Gaststätten. Von hier aus ist man schnell in den Skigebieten Abertamy/Plessberg und Bozi Dar. Karlsbad ist auch nur ein Katzensprung. Wir waren sehr zufrieden.